Dr. Wolfe is a Radiology Resident and, at the time this article was written, Dr. Oto was an Associate Professor of Radiology, University of Texas Medical Branch, Department of Radiology, Galveston, TX. Dr. Oto is currently an Associate Professor of Radiology and Chief of Body MRI, Department of Radiology, University of Chicago, Chicago, IL. The evaluation of abdominal pain in the pregnant patient can be a difficult task that is magnified by related sociologic issues and complicated by the anatomic and physiologic adaptations of the pregnant state. Evaluation is also limited by the need to avoid ionizing radiation. Pathologies directly related to pregnancy are generally evaluated by ultrasound, which usually provides for accurate assessment of the uterus, fetus, ovaries, kidneys, and gallbladder. 1,2 However, ultrasound provides limited and inconsistent imaging of the bowel, pancreas, and other deep structures and may be rendered ineffective by overlying bowel gas or anatomic alteration or variation. In addition, fetal exposure to ionizing radiation limits the use of computed tomography (CT) during pregnancy. Serious fetal risk has not been shown to occur with radiation doses below 10 rad, 3 which is less than any single commonly ordered diagnostic study. However, the International Commission on Radiological Protection has recommended that one should question whether a diagnosis can be obtained without using ionizing radiation if the expected fetal dose is high. 4 The Safety Committee of the Society for Magnetic Resonance Imaging has issued a report stating that "MR may be used in pregnant women if other nonionizing forms of diagnostic imaging are inadequate or if the examination provides important information that would otherwise require exposure to ionizing radiation." 5 While fetal harm has not been reported as a result of magnetic resonance imaging (MRI), the effects of fetal exposure have not yet been fully determined, which suggests cautious use, especially during the first trimester. Particular care should be taken with the use of intravenous contrast, as gadolinium-based agents cross the placenta. Although adequate controlled studies of gadolinium use during pregnancy have not been performed, animal studies have shown an increase in skeletal malformations. 6 It is suggested that these contrast agents be used only in the second and third trimester and when potential benefit outweighs the risk. At our institution, images are obtained with a Signa EXCITE LX 1.5T system (GE Healthcare, Milwaukee, WI) using a phased-array surface coil when possible. Toward the end of pregnancy, a body coil may be required. Informed consent is obtained from each pregnant patient prior to imaging. The backbone of our protocol is T2-weighted (T2W) imaging in 3 orthogonal planes with single-shot fast spin-echo (SSFSE) or half-Fourier acquisition single-shot spin-echo (HASTE) imaging (effective repetition time [TR] = infinite; echo time [TE] = 80 msec; slice thickness = 6 mm). Typically, a 35-cm field of view is used, with a 160-192 × 256 matrix. A fat-saturated T2W sequence (SSFSE/ HASTE or fast spin-echo [FSE]) improves detection of inflammation and characterization of pelvic masses. An axial T1-weighted (T1W) sequence is also included, which may be either a breath-hold spoiled gradient-echo or a respiratory-gated fast spin-echo (FSE) sequence; TR = 700 msec; TE = minimum; number of excitation (NEX) = 3; echo-train length (ETL) = 2; matrix = 256 × 192, slice thickness = 6 mm with 1 mm spacing). The FSE sequence provides better resolution than gradient echo and may be useful for detecting small structures, such as a normal appendix. After review of the noncontrast images, the radiologist may request contrast-enhanced imaging in selected situations. If required, gadolinium may be administered at a dose of 0.1 mmol/kg, and 2-dimensional or 3-dimensional gradient-refocused echo (GRE) T1W images may subsequently be acquired. The evaluation of abdominal pain in the pregnant patient is complicated by the body's adaptation to the pregnant state. Physiologic changes include mild leukocytosis, "physiologic" anemia, mildly elevated alkaline phosphatase, dilatation of the renal pelvis and ureter, and a relative hypercoagulable state. In addition, the gravid uterus compresses and displaces abdominal contents, and abdominal wall laxity during late pregnancy may diminish signs of peritonitis. 7,8 Diagnosis may also be confounded by other conditions common in pregnancy, such as round ligament pain, constipation, and Braxton Hicks contractions. 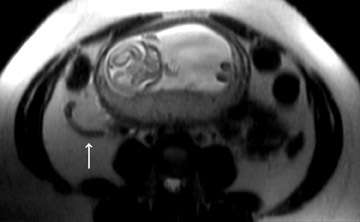 This article presents a brief summary of the use of MRI in the evaluation of abdominal pain in the pregnant patient. Appendicitis is the most common cause of acute abdomen in the pregnant patient, affecting in 1 in 1500 pregnancies. Ruptured appendicitis is associated with a 30% chance of fetal loss, versus a 3% to 5% risk without rupture. 9 Moreover, >40% of patients who undergo appendectomy during the second or third trimesters have a normal appendix, and up to 83% of all pregnant patients who have an appendectomy experience preterm contractions 10 (Figure 1). 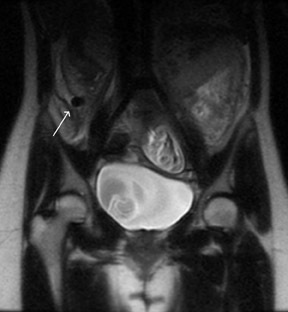 Diagnosis is confounded by "normal" causes of abdominopelvic pain during pregnancy, physiologic leukocytosis, and the fact that the gravid uterus may cause the appendix to shift superiorly, 11 which distorts the classic clinical presentation. Studies have proven the ability of MRI to diagnose appendicitis and differentiate other causes of acute abdominal pain. 12-15 In a series of 50 patients, the overall sensitivity, specificity, and accuracy of MRI for the diagnosis of acute appendicitis in the pregnant patient were 100%, 93.6%, and 94%, respectively 15 (Figure 2). The majority of these examinations were obtained without intravenous contrast. Small bowel obstruction is the second most common nonobstetric surgical indication in pregnancy, complicating approximately 1 in 3000 gestations. 9,16 Adhesions are the cause in 60% to 70% of cases, 9 with volvulus being the second most common etiology at 25%. 17 When surgery is required, fetal and maternal mortality rates are high, approaching 25% and 6%, respectively. 18 The high mortality may be partly explained by delays and errors that result from the physical and diagnostic difficulties created by the pregnant state. MRI provides an effective alternative to CT, yielding multiplanar imaging of the entire bowel without the comparatively high radiation dose. Single-shot fast spin-echo sequences are particularly effective for bowel imaging, 19 minimizing artifacts caused by magnetic susceptibility and peristaltic motion. The third most common nonobstetric surgical emergency in pregnancy is cholecystitis, occurring in 1 to 8 in 10,000 pregnancies. 16 The lithogenicity of bile is increased during pregnancy; in 1 large Chilean study, 12% of pregnant women had cholelithiasis versus 1.3% of nonpregnant women. 20 While pregnancy has not been shown to result in an increase in cholecystitis or symptomatic cholelithiasis, cholecystectomy is associated with miscarriage during the first trimester and premature labor during the third trimester. 20-22 Although signs and symptoms are not significantly altered by pregnancy, 21,22 the diagnosis may again be complicated by physiologic changes related to the state. Ultrasound is obviously the initial study of choice and is generally accurate. However, if overlying soft tissues or bowel gas limits evaluation, then MRI may provide further information. 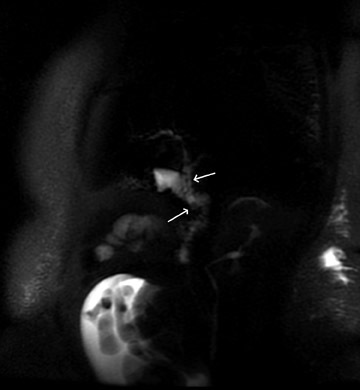 MRI is of particular use if choledocholithiasis is suspected, as this modality most effectively reveals findings of biliary obstruction (Figure 3). Renal stones cause the largest number of nonobstetric hospitalizations during pregnancy, 16 with most patients presenting late in gestation. Diagnosis may be complicated by "normal" dilatation of the renal collecting system, which results from ureteral compression by the enlarged uterus and a progesterone-induced decrease in smooth muscle tone within the urinary tract. "Physiologic" hydronephrosis is usually asymptomatic but may occasionally result in abdominal pain. While ultrasound effectively reveals hydronephrosis, it inadequately evaluates the lower urinary tract and ureteral stones may go undetected. MR urography is an alternative diagnostic tool. Spencer et al 23 described physiologic hydronephrosis as compression of the middle third of the ureter with distal collapse but without an intrinsic ureteral filling defect. 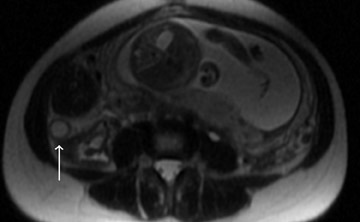 The presence of perirenal fluid, ureteral dilatation, and an associated ureteral filling defect have been reported as MRI signs of pathological hydronephrosis, most likely secondary to a stone. 23,24 In these cases, the possibility of clot, an air bubble (resulting from instrumentation), and flow artifacts must be excluded. Inflammatory bowel disease and its complications may be assessed by MRI, avoiding the comparatively large radiation doses that result from the usual barium studies and CT. Some reports have suggested that as many as one third of patients with inflammatory bowel disease will relapse during pregnancy; this high percentage may partly be related to a discontinuation of medications. 28,29 Maccioni et al 30 have shown a correlation between disease activity and the intensity of T2 signal within bowel wall. In addition to identifying bowel wall inflammation, MRI can effectively show other complications, such as obstruction, abscess, and possibly fistula formation. 31 Single-shot fast spin-echo sequences image the bowel ideally, limiting deleterious artifacts. T2-weighted/T1W imaging with steady state acquisition (fast imaging employing steady state acquistion [FIESTA] or fast imaging with steady-state precession [True FISP]) also provides useful information. 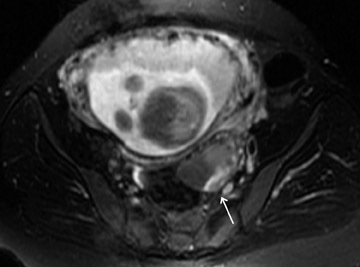 Most pelvic abnormalities (including leiomyomas, ectopic pregnancy, adnexal torsion, hemorrhagic cysts, and masses) are initially evaluated by ultrasound, but MRI may be useful when atypical presentation or ultrasound limitation is encountered. 34 Uterine leiomyomas are seen in approximately 2% of pregnant women and 1 in 10 develops related complications during pregnancy, 35 such as pain resulting from degeneration, rapid growth, or torsion. The major complication is hemorrhagic infarction that is caused by venous obstruction at the lesion's periphery, which generally presents as second- or third-trimester pain, low-grade fever, and occasional bleeding. 35 On MRI, degenerating leiomyomas usually have increased T1 and T2 signal, which may be diffuse or peripheral. 6,36,37 A peripheral rim of high T1/low T2 signal may correspond to obstructed veins. 37 If contrast is administered, the entire lesion fails to enhance. 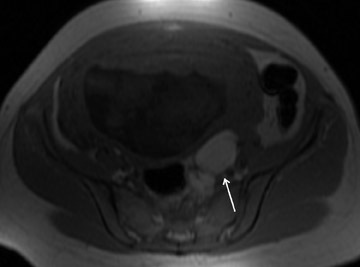 Diagnosis of abdominal pain in the pregnant patient is fraught with multiple pitfalls, as discussed above, including a radiation-induced constraint of most imaging modalities. Ultrasound remains the initial study of choice, but its limitations necessitate consideration of alternative technology. 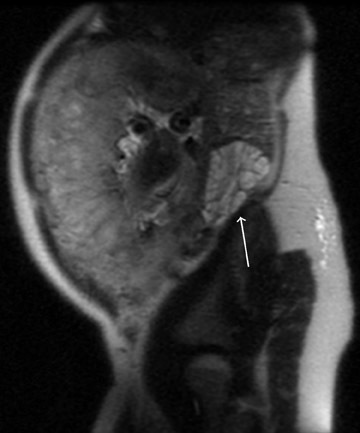 While the evidential role of MRI utilization during pregnancy is currently being investigated, fetal harm has not been shown, and MRI shows clear potential to advance patient care. MR evaluation of acute abdominal pain in pregnant patients. Appl Radiol.